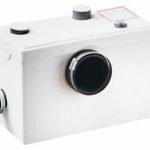 Saniplus Macerator Pump practical, durable and versatile, the Saniplus Macerator Pump makes it easy to install an extra bathroom anywhere in your home. 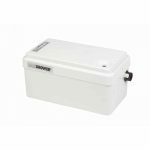 Boasting two inlets, a large tank capacity and a high build quality, the Saniplus Macerator Pump can handle the waste from a toilet, basin, shower and bidet. 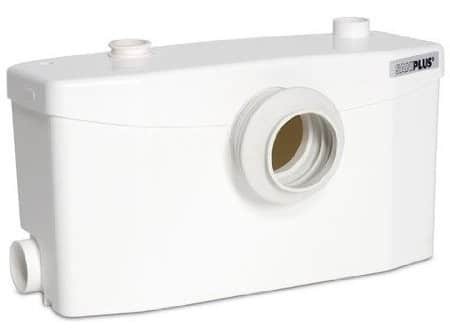 As the Saniplus Macerator Pump has a vertical discharge of 5 metres vertical and a horizontal discharge of 100 metres, the unit allows you to build a bathroom 5 metres below the sewer line or up to 100 metres away from a soil stack. This gives you a huge amount of flexibility when designing and building your new family bathroom, en suite or annex, and allows you to create a home that suits your needs perfectly. Elegantly designed, the Saniplus Macerator Pump will fit in seamlessly with your existing bathroom fixtures and fittings and will help you to create a space that’s stylish, practical and aesthetically pleasing. As the unit has a quiet, discreet function, it won’t cause a disturbance in your home and will allow you to enjoy your brand new bathroom in peace and tranquillity. A Saniflo product, the Saniplus Macerator Pump has been designed to work with other pieces from the range. When used in conjunction with other Saniflo fixtures and fittings, the pump is easy to install, easy to maintain and will function to its optimum capabilities. As the Saniplus Macerator Pump has multiple inlets, it can be used to handle either the waste from an extra toilet or the waste from an entire bathroom. This makes the unit an affordable and flexible option for homeowners looking to add a valuable additional bathroom space to their property. 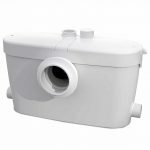 Easy to install, quiet and versatile, the Saniplus Macerator Pump is the perfect choice for households looking to add a stylish extra bathroom or toilet to their property. Thanks to our fast delivery times, consistently low prices and extensive knowledge in the area, we can ensure that your new pump reaches you quickly and in perfect working order, allowing you to get your new bathroom up and running as soon as possible. Get in touch today to find out more and to start building your dream bathroom.